Snares, designed to kill coyotes, are becoming "death traps" for pets in rural Parkland County, according to pet owner Angela Bowring. Snares designed to kill coyotes are becoming "death traps" for pets in rural Parkland County, according to a woman who says her dog was killed by one last week. "It was absolutely atrocious, It was devastating. You don't expect to find them that way. I was hoping that he would be caught—maybe injured—but still alive," said Angela Bowring who is calling on Alberta to tighten its restrictions on trapping. 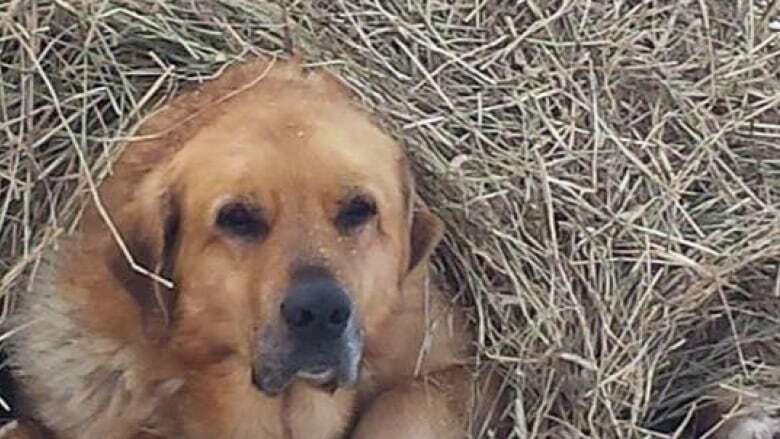 Her dog Marley got caught in a baited cable snare, just a couple hundred metres from her Graminia-area acreage. "I want awareness, so we as a community can take care of our pets, and I want these trappers to use more common sense when they're laying their traps, " said Bowring during a Monday morning interview on Edmonton AM. "You're not allowed to hunt out your backyard so why should you be able to snare?" Bowring says Marley, a Great Pyrenees-lab cross she'd owned since he was a puppy, first disappeared during a battering windstorm on Feb. 5th. Fearing the worst, Bowring began canvassing the neighbourhood, and searching the fields around her home. When Marley was finally found four days later, Bowring said it was a horrible scene. She followed the stench of rotting meat to a stand of trees. There in the dense underbrush was Marley. His throat cut, he lay lifeless, surrounded by a maze of wires and rotting carcasses. A moose head, some deer legs, and the remains of other animals can be seen around the snare. At least four neighbourhood dogs have also been ensnared in this trap within the last month, according to Bowring and her neighbour Sheri Roberts. 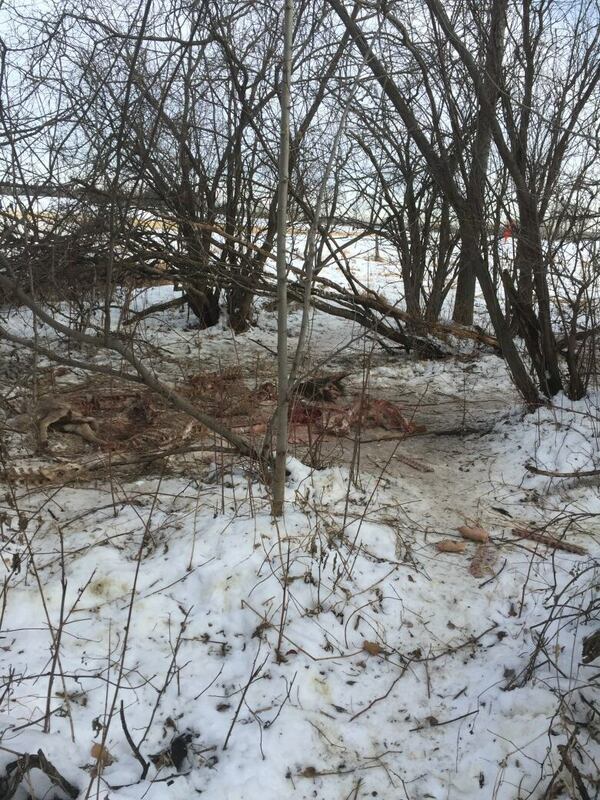 (Supplied ) "There was carcasses everywhere. A moose head, some deer legs, spines, mainly wildlife but there was even some farm animals were in there. And they put these wire-like cables in the bush around it, and hung them above the ground, and then the animals walk right into it," said Bowring. "The snare had been cut from his body, there was a line around his neck." Bowring didn't stumble on the snare by accident, but was led to the trap by her neighbour, Sheri Roberts. Roberts has been checking the snare daily ever since her own dog was caught and maimed in the same mess of wires two weeks ago. "I had a hunch that he was west of us so I went down this old access road. I called for him. I screamed for him and then I heard a whimper," said Roberts. "He wouldn't come to me and I couldn't figure out why. It never crossed my mind that it was a snare. "He's got quite the scar on his neck, and he's still healing but he's alive at least. It was scary, very scary." According to Roberts, since Marley was found dead, she's discovered two more neighbourhood dogs ensnared in the trap, injured, but still alive. "It's just terrible that they're baiting and trapping like this, " said Roberts. "It's just disgusting." Both Bowring and Roberts have complained to Parkland County and the province, but say their concerns have fallen on deaf ears. The snare is completely legal under provincial guidelines. The trapper is fully licensed and has been granted full access to the private farm, and unless those privileges are revoked by the property owner, the snare will remain intact. "Nobody can do anything," said Roberts. "It's always someone passing it off to someone else." Officials with Parkland County confirm trapping in the jurisdiction is a provincial concern, and they will not be investigating. CBC Edmonton is still awaiting comment from the province on their response to Bowring's complaint. Although Bowring understands the need for predator control on farms, she continues to worry about the unintended consequences of trapping near residential areas. "People will say this was on private property and they're right. But pets, and even kids, they don't have boundaries. They don't have borders. They don't know better. What's it going to take? Who is going to be their voice and say 'this is too close to home.' "